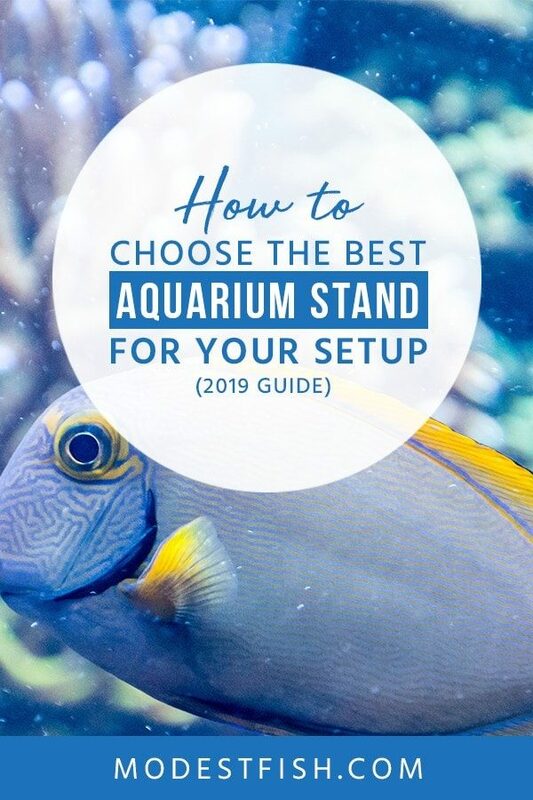 In this article, you’ll discover how to choose the best aquarium stand for your setup. You’ll learn exactly what you need to consider when choosing, and then, at the end I’ll share my reviews for the best stands currently available. Let’s start by discussing how you can effectivley choose the right aquarium stand for your fish tank. 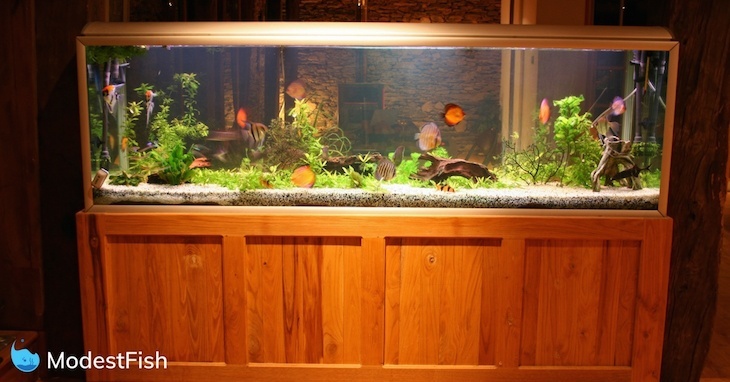 The specifications of your aquarium must be taken into consideration when searching for an appropriate stand. A larger, heavier aquarium should be supported by a suitable stand that is both strong and durable. The stand’s strength should match the gallon capacity of your tank. Some stands are built to uphold rectangular tanks, while others are shaped to better accommodate aquariums with bow-shaped fronts. 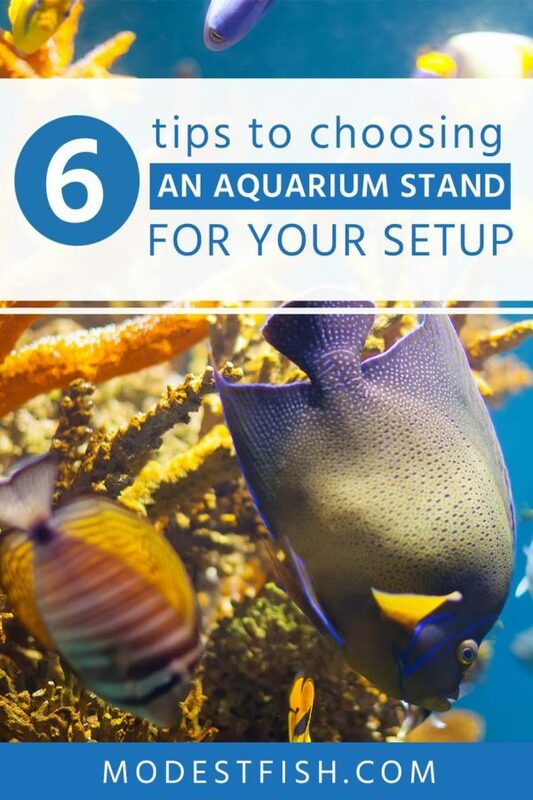 Be sure to choose a stand that is suited to the shape of your aquarium. What Material is the Stand Made Out Of? 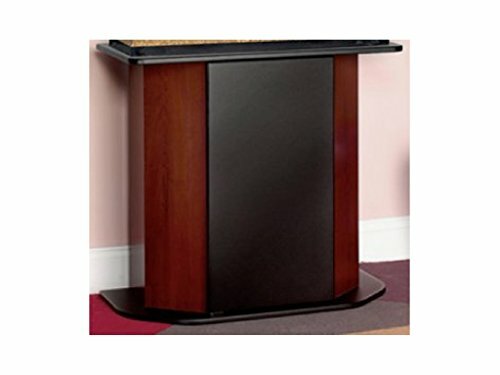 There are many different types of materials that should be considered when looking at purchasing an aquarium stand. Particle board the the least expensive option. It is the wooden material often used to build store branded stands. 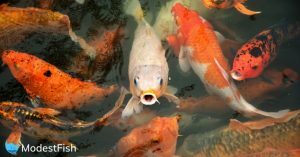 Though inexpensive, particle board is not suitable for upholding saltwater aquariums. Wood does not mix well with humidity and may degrade overtime if exposed to it. Plywood is the standard choice of material and is used by many higher-end brands. It is significantly more durable than MDF, often being used to build furniture and cabinets. For a stronger material made to last and uphold heavier tanks, plywood is a safe option. 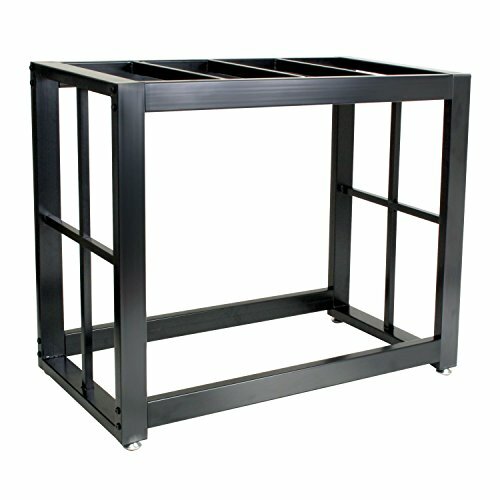 Lastly, larger aquariums are often supported by metal stands. Metal offers exceptional structural support, able to uphold greater weights without sustaining damage over time. Taking your aquarium’s humidity into account is crucial for the longevity of your stand. 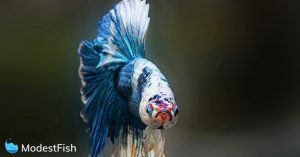 Purchasing a stand inappropriate for a saltwater tank, for instance, may result in it degrading, crumbling, and harming your fish. 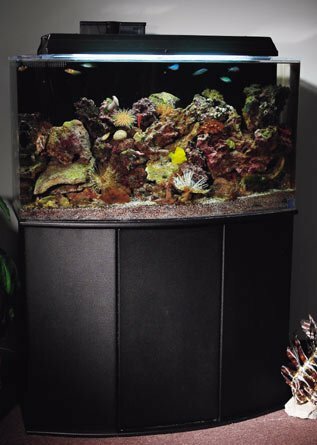 Your aquarium stand has to provide enough space for you to store your equipment. Reef aquariums, for example, require a considerable amount of equipment. Tanks with large door openings and adequate space can assist you in hiding this equipment, preserving the beauty of your tank. If you’d like your aquarium to have a sump, you’ll have to account for the room it’ll take up when you’re browsing for a stand. It is wise to purchase a tank with concealable storage and holes in the back board to feed wires through if you wish to maintain a tidy aquatic space. If you’re a beginner aquatic hobbyist, or likely to want to move your tank’s location at any point in the future, you’re probably best to purchase a tank stand that is easy to set up. Ease of setup is an often overlooked factor that can cause many complications if not accounted for. Some stands come fitted with metal-to-metal cam fittings which can be trickier to assemble than wooden screws. Your experience in assembling parts should be taken into account before purchasing a stand. 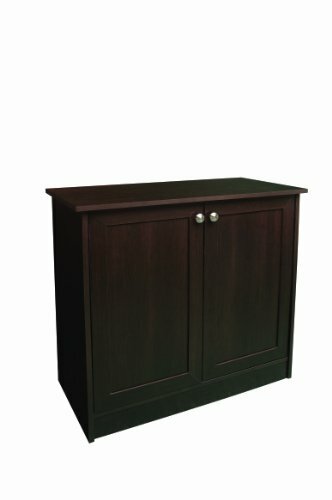 What is a Good Aquarium Stand Height? A common, and very good question. The height of your stand will affect the visibility and accessibility of your aquarium. If you have a shorter tank with few species of fish, you’re going to want a tall stand that’ll make it far easier for you to see and interact with your animals. Stands can also be purchased with adjustable feet. Others are fixed in their height. This feature can be useful if you wish to raise or lower your tank depending to suit its surroundings. If your tank’s appearance is at the top of your priority list, you should certainly take into consideration the look of a chosen stand before purchasing it. There are many different types of stand. Some are sleek, black and modern. Others sport vintage, rustic wooden aesthetics. Striking a balance between aesthetic value and product quality is the key to making a sensible and appropriate purchase. Because there’s no one-size-fits all when it comes to aquarium stands, I have split this review section up depending on aquarium size. Lets review the best aquarium stands for fish tanks between 0 and 29 gallons. The Coralife BioCube Stand is designed to uphold tanks that are between 29 and 32 gallons. It’s 21.5 x 20.5 x 29.5 inches. Each stand comes with a shelf for storage of equipment, as well as cut-out holes in the back for feeding electrical cords through. The stand is easy to set up and is crafted from water resistant materials, making it suitable for salt and freshwater aquariums. Imagitarium offers an attractive stand, fit for upholding tanks up to 29 gallons. The stand is crafted from solid, genuine wood with an espresso stain finish and raised feet underneath. Its internal shelf is adjustable and provides convenient storage for your equipment. Sturdy, high-quality and easy to assemble, Imigatarium’s tank is an ideal option for aquatic hobbyists looking to showcase the beauty of their aquarium. 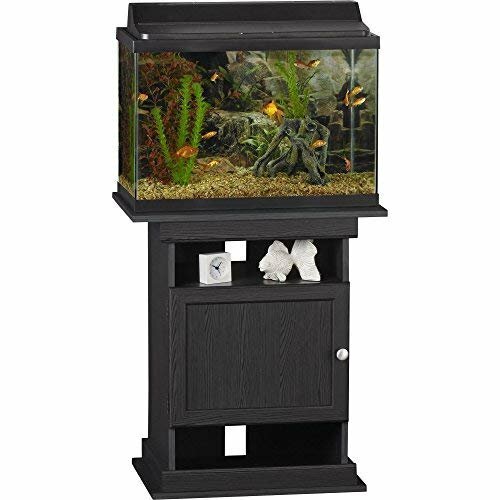 Altra’s wooden aquarium stand supports 10-20 gallon aquariums and is built from laminated MDF and particle board. 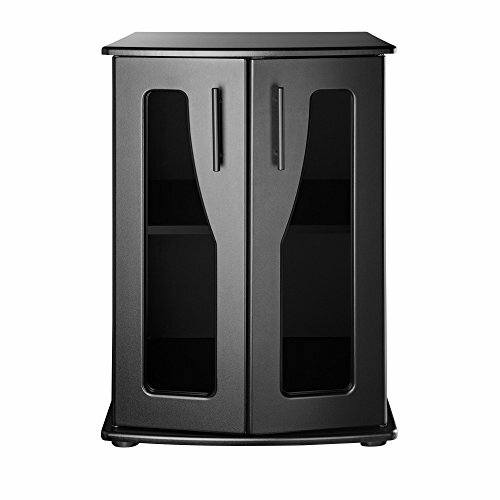 The #1 bestseller in its category on many common markets, this attractive black sports an open top and bottom, providing room to display home decor and store equipment. It features a unique design and is easy to assemble – a strong choice for smaller aquariums. 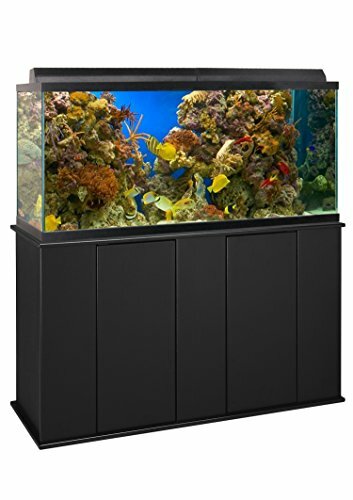 The Aqua Culture Deluxe Aquarium Stand can accommodate tanks of up to 20-29 gallons. Featuring a concealed storage area behind its door, this stand allows you to store equipment without upsetting the appearance of your tank. The tank is moisture-resistant, therefore able to uphold saltwater aquariums without degrading. It’s a durable option, built to last from solid, genuine wood with reversible front panels, allowing you to choose between either cherry or black colour to suit your preference. This sleek, elegantly constructed cabinet in an espresso finish is both attractive and durable. Fitted with two stylish swing-open doors, Fluval’s stand provides ample storage space without hampering the beauty of your tank. The cabinet has a cutout at the back panel, making it easy to implement water drainage systems and to run wiring through. It’s easy to assemble and holds tanks of up to 29 gallons. 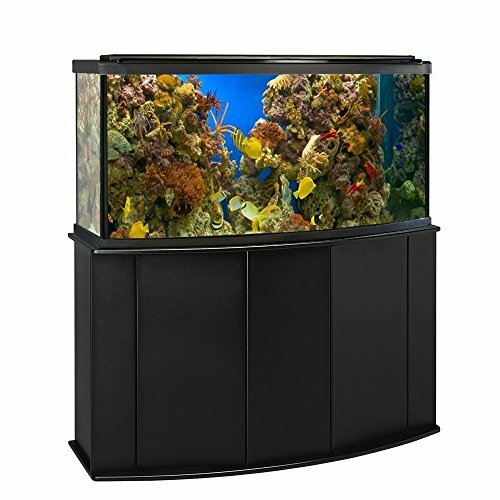 Aquatic Fundamentals’ aquarium stand is unique in shape, making it suitable for bow-front aquariums. The stand is built from dense, moisture resistant fiberboard, able to maintain its integrity and shape in humid conditions. It has a black, powder-coat finish coating, blending well with most interior designs. Easy-to-assemble, this stand makes use of metal-to-metal locking, resulting in a sturdier, durable piece that is made to last. Okay, so now let’s take a look at some of the best aquariums stands for anyone who owns a 30-50 gallon fish tank. Made from durable solid steel, Imagitarium’s metal tank stand is built to hold tanks of up to 40 gallons. The stand features adjustable feet, allowing you to change its height to suit the size of your tank. 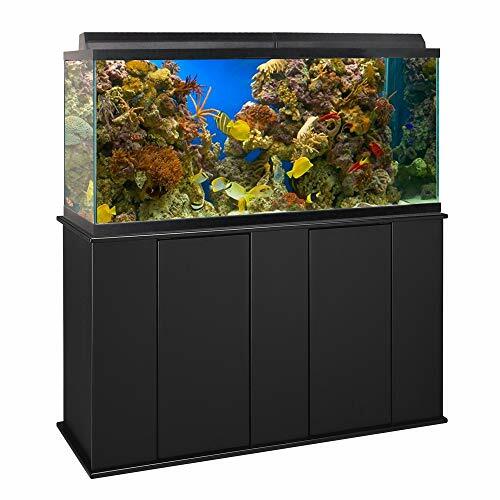 Its sleek, modern black finish suits most homes whilst preserving the beauty of your aquarium. The tank is also available in a variety of sizes. This moisture resistant stand features strong metal-to-metal locking cam assembly as opposed to weaker wooden screws. Packaged with detailed instructions, it is easy to assemble and requires little experience. The stand is sturdy and hardwearing, crafted from dense, long-lasting fiberboard. This product is simplistic, sporting a black coating and basic design that won’t interfere with the overall look of your tank. Aquarium stands for 55 gallon tanks are one of the most sort after. Let’s take a look at some of the best available today. Aquatic Fundamentals also offer a 50-65 gallon tank, as well as their lower-capacity counterpart. Its front door makes for easy access and can comfortably store pumps, filters and food. The back of the stand is open besides a single supporting brace, making it easy to feed wiring and tubes through it. This unique tank is built from rustic brown wood and particleboard, suitable for any rustic, shabby-chic living area. Though sturdy and built to last, this stand is not moisture resistant and thus is not appropriate for upholding saltwater tanks. It features four doors and shelves to hold food and other equipment, as well as food and water treatments. Each shelf holds up to 15lbs, making this stand an ideal choice for heavier tanks and hardware. You get the idea now. We’re moving onto the 70+ gallon aquarium stands. 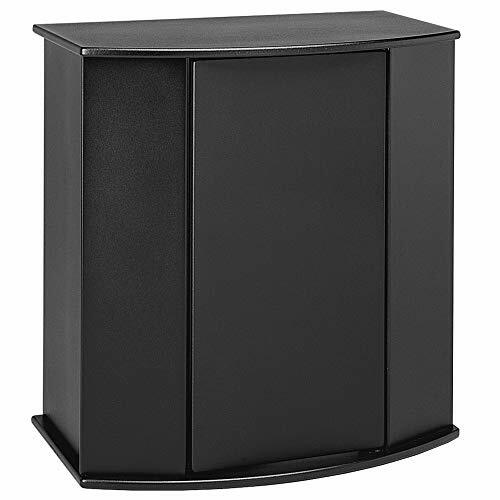 Similar in style to their smaller counterparts, Aquatic Fundamentals also supply larger 75 gallon aquarium stands. The tanks’ modern and sleek appearance is built to showcase rectangular aquariums, topped off with a powder-coated finish for extra moisture resistance. 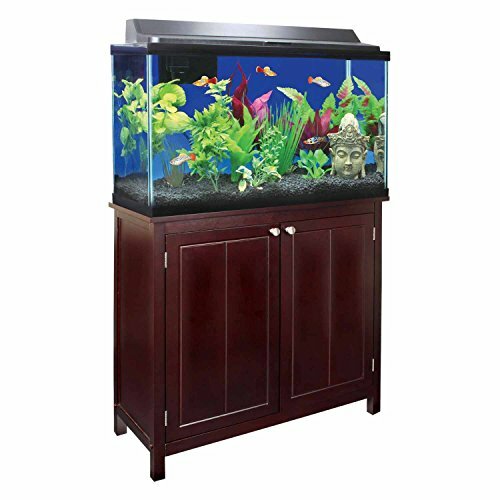 The extensive range of Aquatic Fundamentals’ aquarium stands also features a bowfront design, suited to tanks of varying shapes. This stand is both affordable and durable, making it a smart choice for those looking to buy larger tanks on a budget. It’s easy to setup, too, and offers plenty of storage space inside. 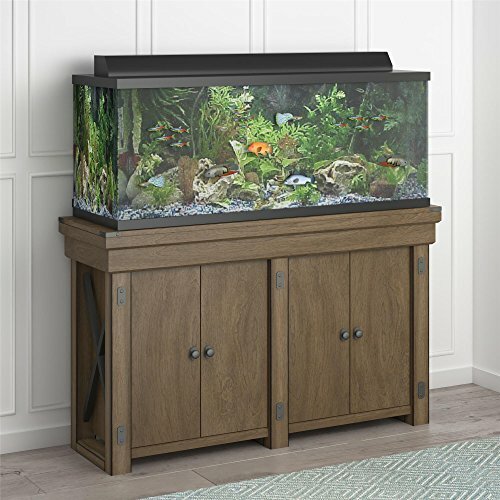 Look, at the end of the day, if your chosen aquarium stand can safely hold your fish tank’s weight and provides enough room for you to keep all your equipment–you’re on to a winner.